I hope I don’t catch any fuss for this, but I am totally in love with the new tart pan I shared with you last week. I find myself scrounging through the vegetable bin to see what kind of tart I can make next! 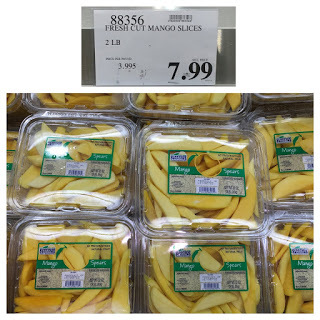 This week, when I went to TraderJoes they had the most beautiful mango’s on special. I was certain I could make a tart from these beautiful tropical fruit. California Girl comments: I think I need to go to Ikea and get one of those beautiful tart pans. It’s only a half hour away from where we live. In the coming weeks Ms. April makes more fabulous tarts so I need to get one! Cleaning a mango is a bit of a challenge. 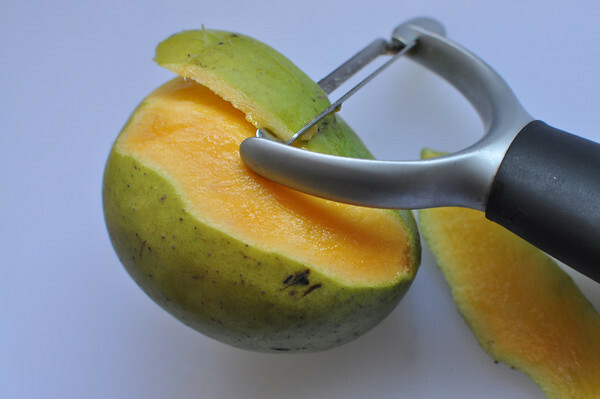 First, I peel them, and then I cut close to the seed on all four sides, leaving me four nice thick slices. 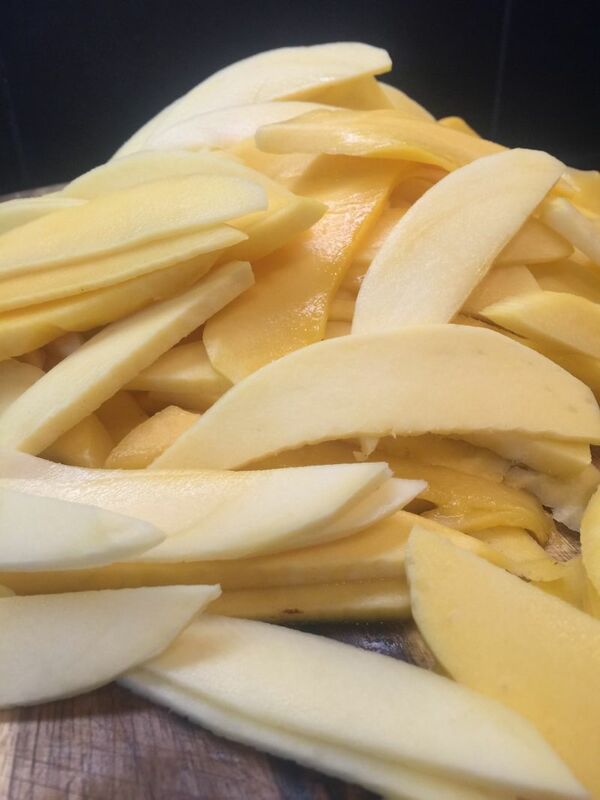 When I make this in a hurry, I can often find pre cleaned mango’s at Costco, and that speeds the process up a lot! This week is a summer dessert, that is perfect after an outdoor meal on the BBQ. It’s also a lovely dish to take to a dinner with friends, and I promise they will all be “oohing and ahhing” when you walk in the door. It takes a little while to make this dish, but is worth the effort because it is absolutely beautiful. We are going to use the same recipe for crust that we used last week, but since this is a sweet dish we will be adding a little sugar. 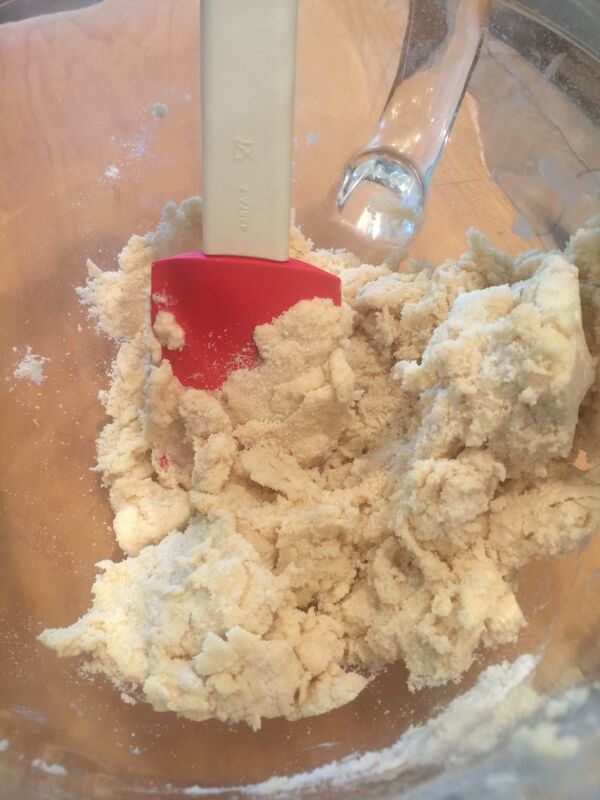 In your Kitchen Aid Mixer, put the flour, sugar, salt and cornstarch. Mix. 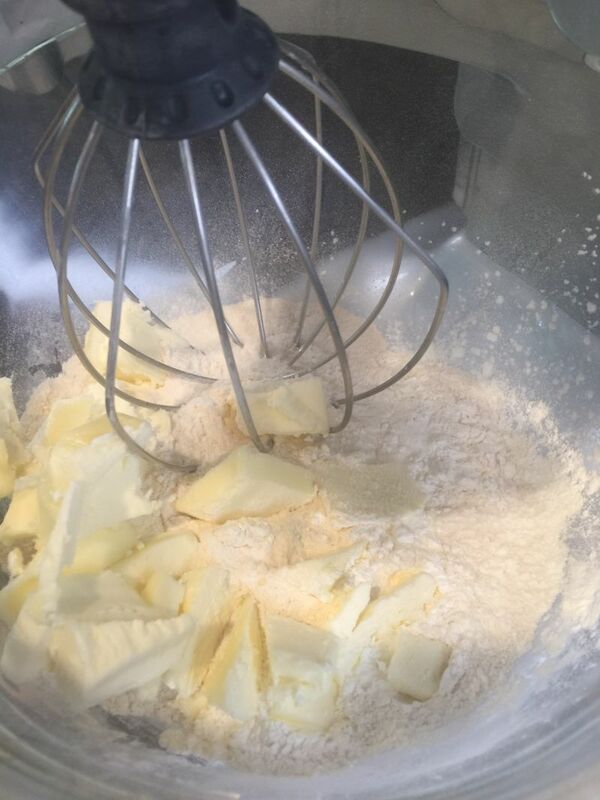 Cut the chilled butter into small pieces and add to the flour mixture, and using the whip attachment, mix until the mixture looks like coarse bread crumbs. 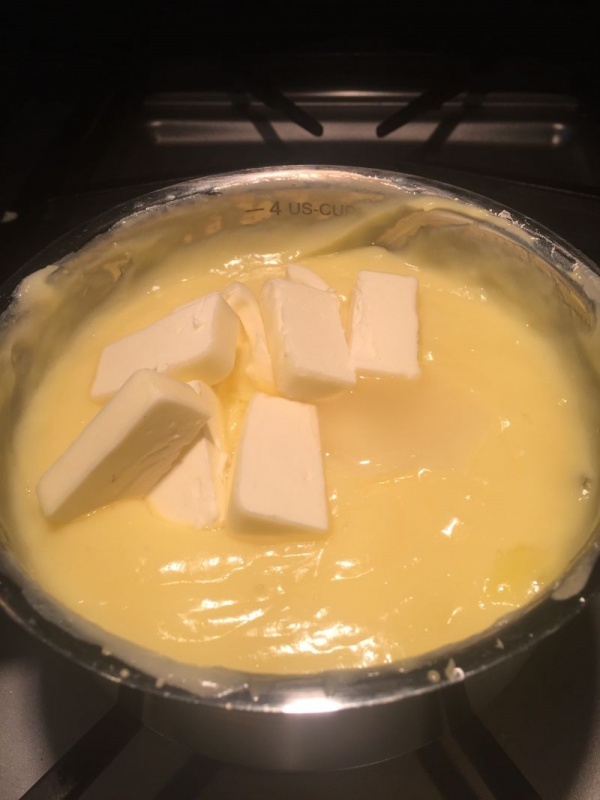 All of the butter will be finely mixed in. Remove the whip and bowl from the mixer. 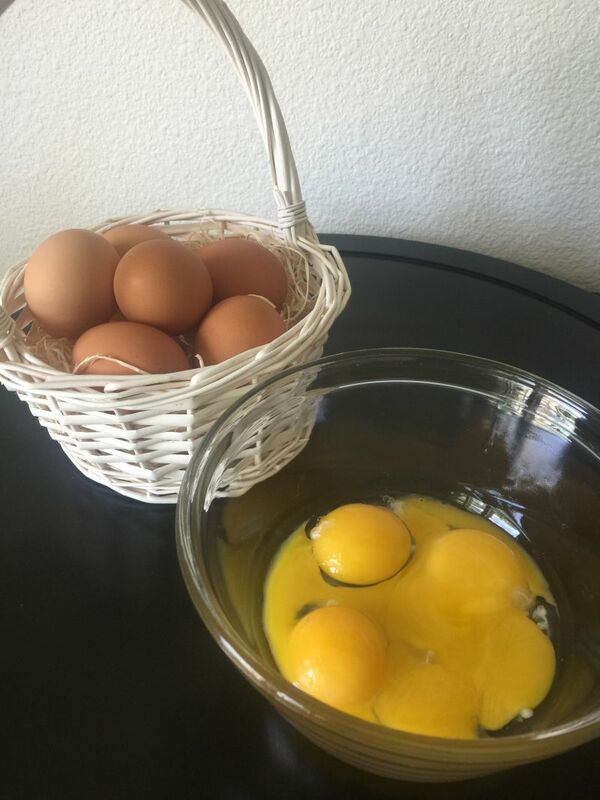 In a separate bowl, mix the egg and water with a small wisk. 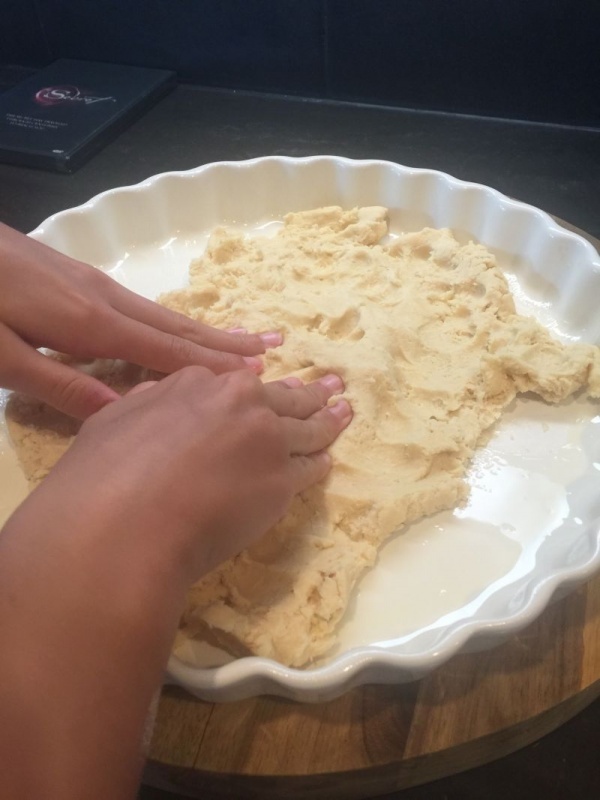 Add to the flour mixture, and using a rubber spatula, gently fold the flour mixture and egg mixture together until all is moistened and forms a ball. Do not over work or your dough will be tough. 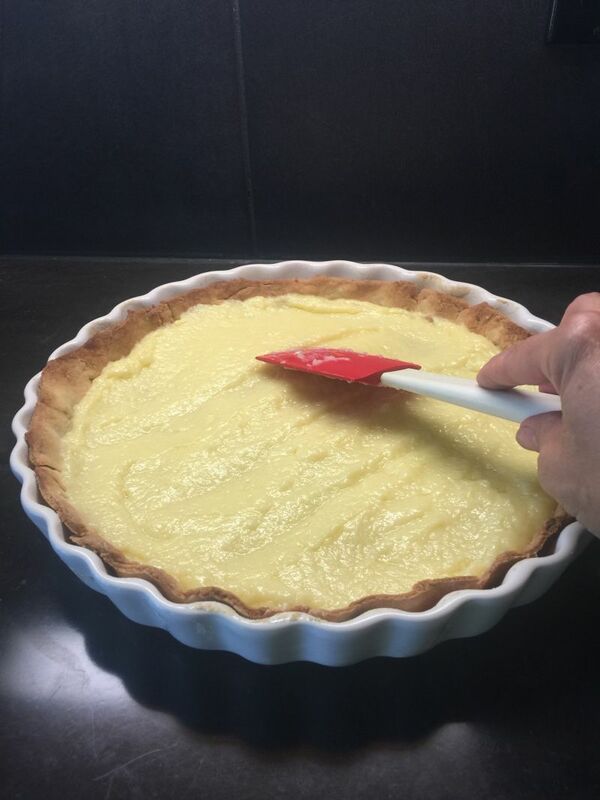 Now, you can roll like a traditional pie crust and place in your tart pan, or you can skip the mess and just press it into the bottom of your greased tart pan, using the pads of your fingers. Make sure you press it up the sides as well. This is my preferred way when making a tart. Bake in a 375 degree oven until golden brown and a bit puffy. If it comes out of the oven with high spots, gently press them down with the back of a large spoon. Cool completely. In a medium sized sauce pan over medium heat, place the half and half , the remaining sugar and the salt. Gently stir together as it heats to a simmer and the sugar is completely dissolved. 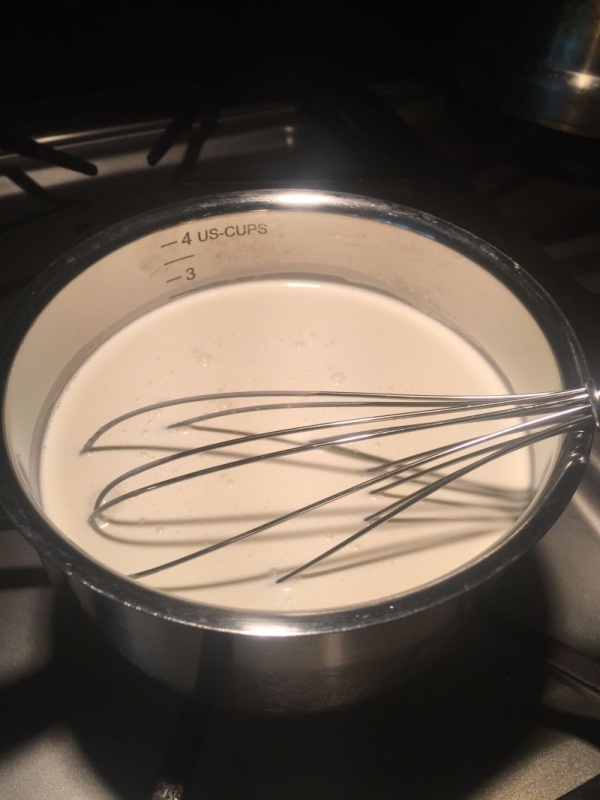 Now you’re going to learn what it means to “temper.” Using a whisk, pour a thin stream of the milk mixture (while still hot) into the egg mixture and whisk continuously. 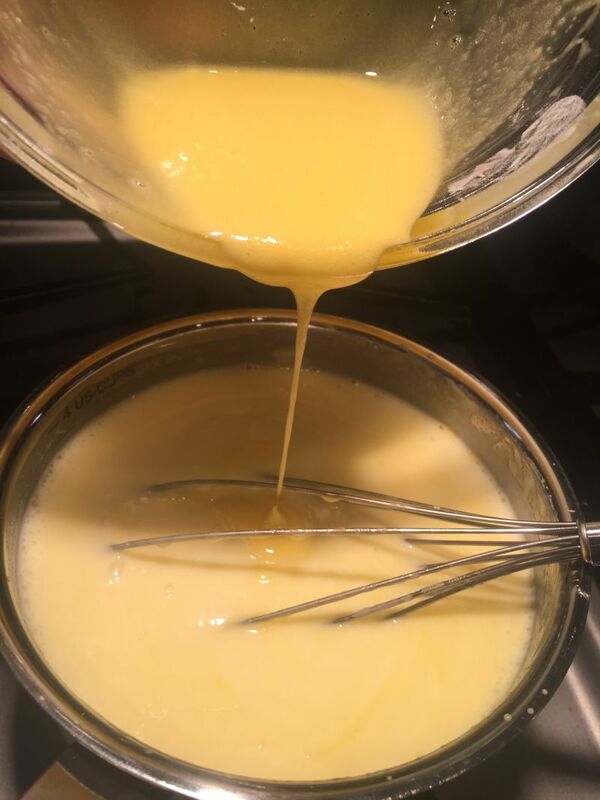 When it is all mixed together, pour the mixture back in to the saucepan, add the butter and vanilla and simmer on the stove while stirring constantly, until it is bubbly and gets a glossy finish. If you pour too quickly, you will end up with scrambled eggs, so take your time! Cool slightly, and pour into your cooked tart crust. Place a piece of Saran Wrap over the top, making sure the wrap is pressed against the surface of the filling so that it doesn’t get a “skin” on it as it cools. Chill for an hour or two in the refrigerator. 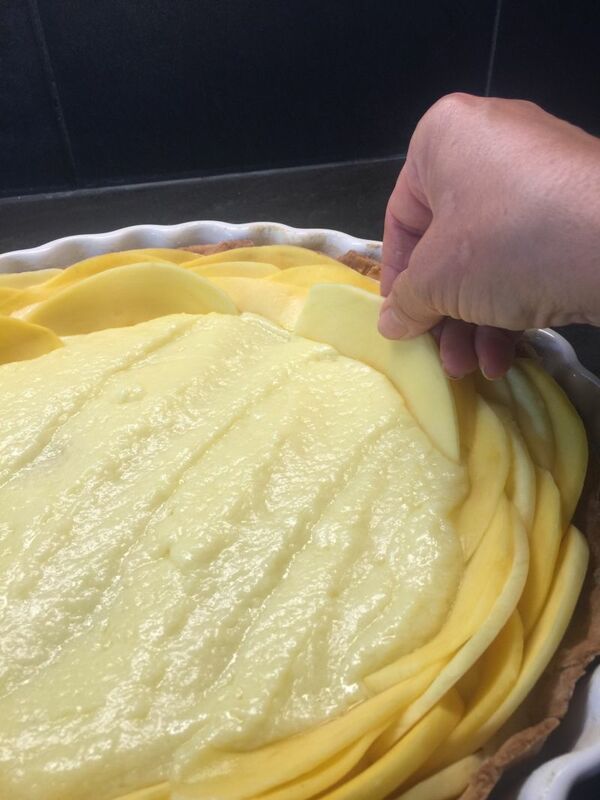 Place the thinly sliced mango’s around the edge of the tart, overlapping slightly. Continue going around in a spiral shape until the center. 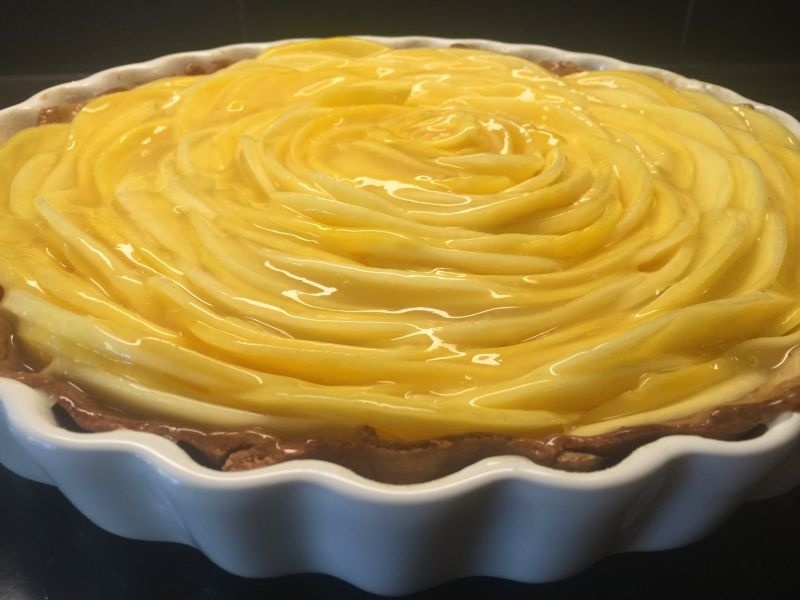 Take one slice of mango and roll up like a cinnamon roll and place in the middle of the tart. Nestle the remaining slices in between other slices to fill any gaps you may have. Whisk the cornstarch and water together until smooth. Add to the pineapple juice and heat in the microwave until thick and bubbly. Cool slightly. 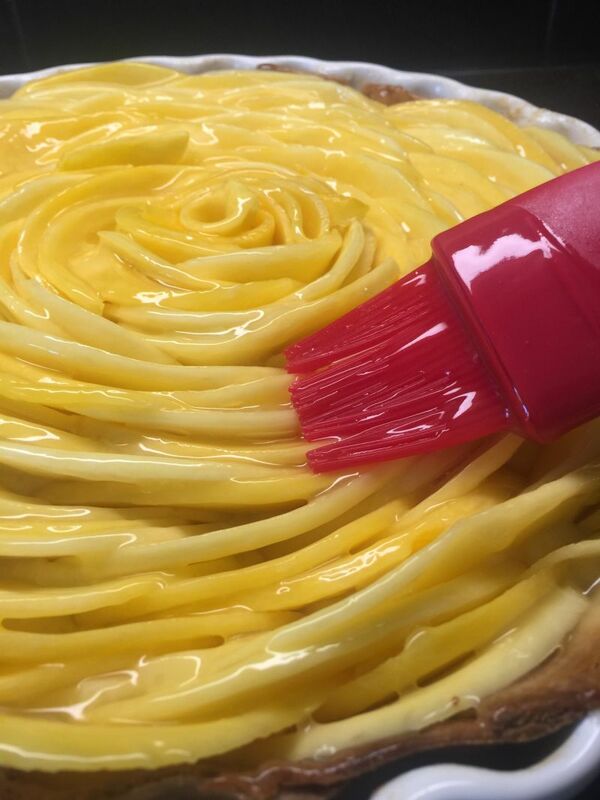 Spoon over the mango slices, and then spread evenly with a pastry brush, making sure to cover all surfaces of the fruit. Chill~ then cut in wedges and serve! This tart keeps overnight beautifully, so it is perfect to make the day before! 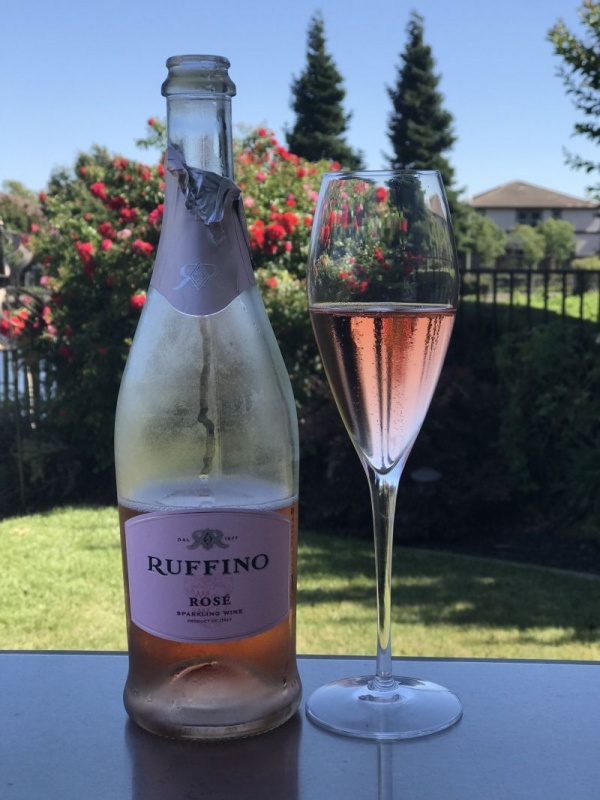 California Girl comments: This week’s pairing is a sparkling rosé from Ruffino. It is a bargain wine of the week and can be purchased easily for about $12.00 per bottle. 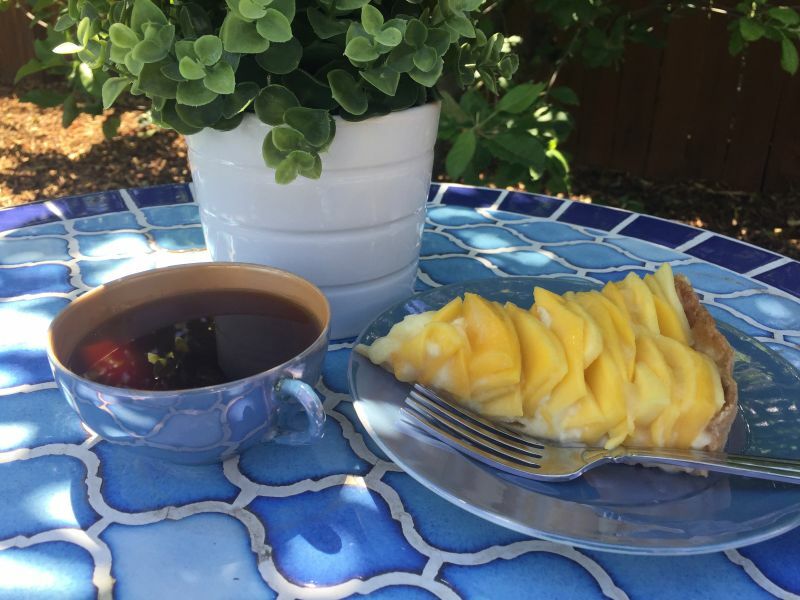 It’s light, slightly dry, fruity flavor and sparkles in the mouth will be a great pairing with the sweet mango. I might add, I had the leftovers for breakfast and it was yummy. When it has fruit, it doesn’t count as a dessert, right?